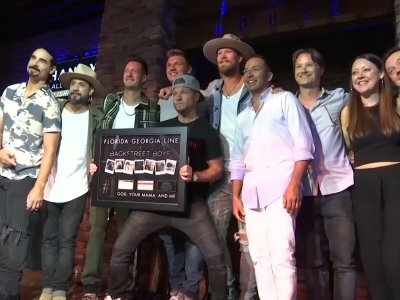 NASHVILLE, Tenn. (AP) — Country duo Florida Georgia Line has built its career one hit song at a time thanks to key collaborations, while also taking quiet steps to establish a lasting songwriting legacy in Nashville. Since blasting into the music scene in 2012 with “Cruise,” featuring Nelly, the duo of Tyler Hubbard and Brian Kelley is once again commanding the charts with Bebe Rexha on their co-written midtempo smash “Meant to Be.” The pop crossover hit is already three-times platinum and surpassed the number of weeks that “Cruise” spent on top the Billboard Hot Country chart. “Meant To Be” has been at the top for 28 weeks now, marking the longest time for a song by a woman to reign at No. 1, but it’s still behind the all-time country chart leader “Body Like a Back Road” by Sam Hunt at 34 weeks. “They tend to write the songs that make the whole world sing,” said Craig Wiseman, writer and owner of Big Loud, the publishing, management and record company that initially signed the duo. They’ve collaborated with artists like The Chainsmokers, Hailee Steinfeld and the Backstreet Boys and have teased new collaborations with Jason Derulo and Jason Aldean that will be on their upcoming fourth album, which doesn’t have an official release date yet. “Meant to Be” came out of an improbable last-minute co-write in Los Angeles set up by their respective managers. Hubbard said they were at a loss for ideas as they headed over to the studio when his wife Hayley offered some advice. Within hours, the three took that line and made it the chorus of the song. Although initially marketed as a pop song, the song quickly crossed over to country markets. Rexha has clapped back at critics who have questioned whether “Meant To Be” belongs on the country chart. The pair has survived being initially painted as bro-country partiers following their first album, “Here’s to the Good Times.” Each successive album has allowed them to reshape their image as they write about their faith and their families. Both are married and Hubbard is a new father to a baby girl. Their newest single, “Simple,” is yet another re-invention with a more stripped down, folk-rock sound. After honored as trailblazers by Billboard magazine recently, Kelley said they’ve been successful by not following a traditional path in country music. Their collaborators and co-writers say that they are hard workers and committed to writing as often as possible. When not in Nashville, the duo has a Tree Vibez writing bus that will go out on the road with them, or with other artists, which gives them a place to write and cut demos just about anywhere. Each Friday their writers send them demos of songs and they’ll respond back with comments and critiques. Wiseman said in the midst of all their success, the two have always made time to help out new artists or writers that they believe in. One example is Jordan Schmidt, one of their writers who has co-written three recent No. 1 country singles — Jason Aldean’s “Lights Come On” and “You Make It Easy” and Kane Brown’s two-week chart topper “What Ifs” with Lauren Alaina. If you asked the pair how they’ve been able to write hit after hit, they attribute it to God’s plan to work through them. This story has been corrected to fix the spelling of Brittney Kelley’s first name.